I’m thankful for my family and friends. A few years ago, I didn’t know many of the friends I have now (including several of you, dear readers) and I’m so grateful to have wonderful people in my life. I’m grateful that my 16-year-old cat recovered from a serious illness so well that he now looks and acts healthier than he has in years. I’m thankful that I’m still on-track to finish NaNoWriMo even after having pneumonia. I’m grateful that people in our country still think it’s important to take a day of Thanksgiving. Though it’s just “turkey day” to some, there’s plenty of good people out there who remember why we’re spending a day giving thanks. And here’s a link to an article for all my introverted friends wondering how they’ll survive the social getting-together that happens on Thanksgiving: 9 Quick Tips to Save Your Sanity This Thanksgiving. Just remember — occasionally needing a break from your families doesn’t mean you don’t love them. It means you like them enough to give yourself the space you need so you don’t get cranky and take it out on them. This is turning into a thoroughly random blog post, but why stop now? I tried a new recipe this Thanksgiving: Pumpkin Snickerdoodles. My sister has discovered Pinterest, so she sends me all the food she thinks looks good in the hope that I’ll make it for her. Snickerdoodles are my favorite cookie, so I decided to try this one. The addition of pumpkin adds a unique spin on the flavor that’s perfect for fall. I’ve linked to the recipe so you can try them out yourself, or at least stare at the delicious pictures. And lastly, a shameless plug for my Etsy shop. The Geek Spa is having a Black Friday sale. Use code “BlackFriday” for 20% off now through Monday. I started watching Doctor Who a few years after “new Who” started, begining with Eccleston and continuing on in order. I liked Nine, but fell in love with Ten. Even though I was still catching up at that point, knew it was coming, and had Matt Smith episodes that I could watch, I went into mourning for a month after he regenerated and refused to watch any of Eleven’s episodes. But I finally did, and I liked him almost instantly. … and then it was Peter Capaldi, and I stopped freaking out. That’s when some of my friends started freaking out, though — he’s too old and too grumpy and shouldn’t be trusted with our favorite character. But I had a good feeling about him for some reason. I think I was right. It takes a while the first episode after the Doctor regenerates for him to settle into a personality, and he flitted through a few of the old ones before we got a good sense of who he’ll be now (including asking for a very long scarf and screaming “Geronimo”). Still, I think I’m going to like the Doctor this way. And I have very, very high hopes for the upcoming “Robot of Sherwood” episode (I’m a bit obsessed with Robin Hood legends. Actually Medieval things in general). Steampunk title sequence! Last time they changed the title and music I was upset, but this time I liked it. I suppose the gears are actually supposed to make me think of time and watches rather than steampunk, but who cares — it was cool. Like bow ties. “Girl In The Fireplace” is my favorite episode, so I loved the parallels here. Well, “loved” in the sense that I liked how it reminded me of this episode even though robots harvesting human beings for spare parts is bloody creepy. One of my favorite scenes is where the Doctor is talking with a homeless man (didn’t catch his name, but planetclaire.org says it’s Barney) about his new face. The Doctor: Why this one? Why did I choose this face? It’s like I’m trying to tell myself something. Like I’m trying to make a point. But what is so important that I can’t just tell myself what I’m thinking? I’m not just being rhetorical here. You can join in. Barney: I don’t like it. The Doctor: Well I don’t like it either. I mean it’s alright up to the eyebrows. Then it just goes haywire. Look at the eyebrows! These are attack eyebrows. You could take bottle caps off with these. Barney: They are mighty eyebrows indeed sir. The Doctor: They’re cross. They’re crosser than the rest of my face. They’re independently cross! They probably want to cede from the rest of my face and set up their own independent state of eyebrows. That’s Scot, I am Scottish and I’ve gone Scottish. Barney: Yes you are. You are definitely Scot sir. I hear it in your voice. We see you, Mr. Capaldi. And you look like The Doctor. Not my Doctor perhaps, but certainly a Doctor we can learn to love. My Etsy store is now open! The first Doctor Who theme products are online, and I’ll be adding more over the next couple days, as well as a few Sherlock-theme items. For this first week, use the coupon code “OPENING5” to get 5% off at check-out (expires 5/18/2014). Earlier this year, when I was at a youth retreat over President’s Day weekend, something was said in a seminar that has been floating around the back of my mind ever since. He was talking about goals, and said that we should write out goals so big that if we attain them we’ll know we couldn’t have done it on our own. 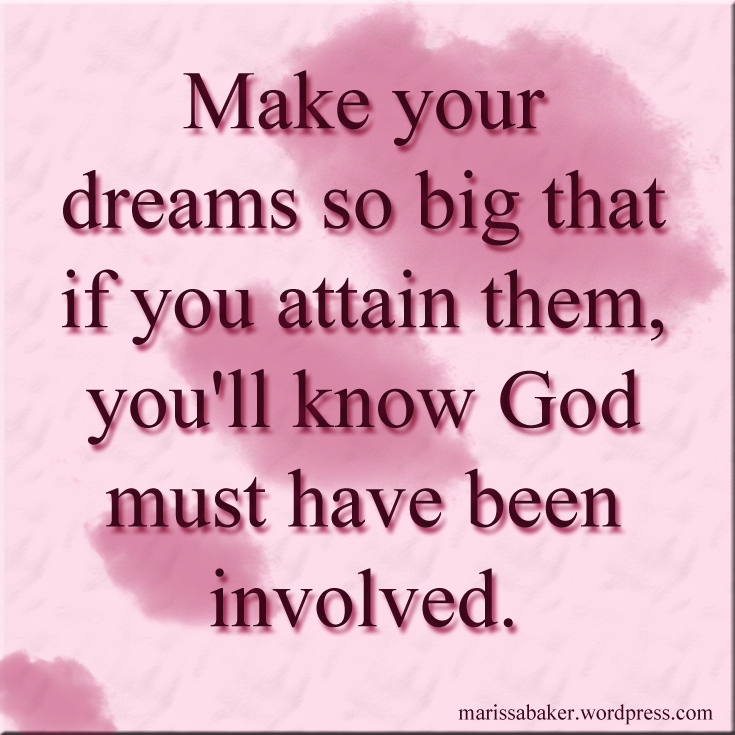 In other words, we should make our dreams so big that when they come true, we’ll know God must have been involved. I was reminded of this when listening to Casting Crown’s new album “Thrive” yesterday. One of my new favorite songs, “Dream For You,” includes these lines. Isn’t this a beautiful idea? to think that God has dreams, and hopes, and plans for you that are bigger and better than anything you can imagine, and that He wants to dream with you? This is especially encouraging for me right now, two years out of college and still struggling to decide what my next move should be. For as long as I can remember, my dreams have involved doing something creative to earn money while staying at home to raise a family. It might not seem like a very big dream, but it’s important to me and, while I can get excited about an idea that would move in a different direction (such as returning to grad school and focusing on my research about Christianity and gender roles in 18th century literature), I can’t seem to feel at peace with that decision for more than, oh, 36 hours. That’s why I’ll be launching an Etsy store shortly to supplement income from my copywriting and, hopefully, fiction writing. Stay tuned for more news about that in the next couple weeks! As far as I can tell, the marriage and family part of my dream is still quite some way from being realized, but I can work on this working-from-home part of my dream now and trust God for the rest — or trust that He’ll come up with an even more amazing dream for me.